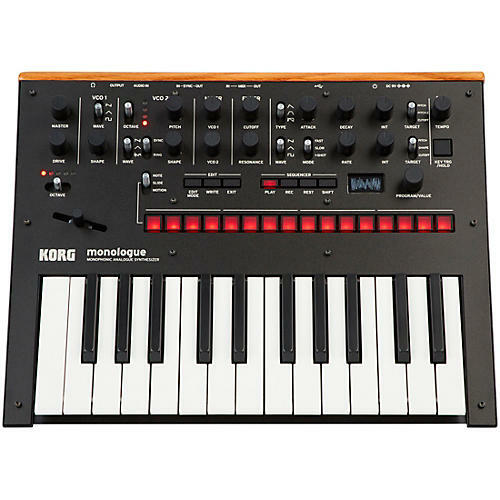 The monologue by Korg is a programmable analog monophonic synthesizer that shares the sleek layout, knob-per-function workflow and high-quality construction of the best-selling minilogue. monologue is a new synth for all types of musicians; rock keyboard players appreciate its sine, saw and square wave leads and EDM producers will find its bass patches attractive for recording and shows. monologue gives you knob-per-function programmability, so you can create everything from crushing basses to crisp leads and complex rhythmic soundscapes quickly and easily. Even better, monologue has 100 program locations (80 preset + 20 user), a first for an analog keyboard in this price range. Each location can also retain its own 16-step sequence, including motion sequence automation. monologue features a 25-key version of the same great-feeling key bed as minilogue, but instead of traditional C to C octaves, monologue is laid out E to E, so those low bass notes are always there! With a low E at your fingertips, guitarists and bassists will feel at home adding monologue to their live rig to expand their sound palettes.